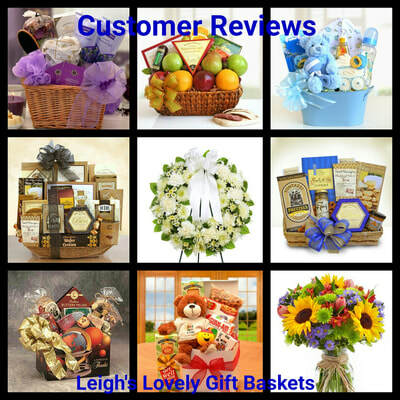 "I have used Leigh's Lovely Gift Baskets about 4 occasions so far. Each one of the recipients commented on how delicious the fruit tastes along with how attractive the arrangement of fruit was presented. I find the navigation on the web page to be user friendly and quite easy to get around. I will look forward to using this Gift of Hospitality on numerous occasions in the future. It provides a particular support of comfort to those who could sure use a "lift" in their spirits." "Didn't have a chance to tell you that the flowers I ordered for Chris are still doing well. They were gorgeous. The best arrangement I ever paid for"
" I ordered multiple bouquets from La Bella Baskets for my daughter's wedding reception. Leigh Spittel was very helpful with all my questions, especially concerning quantities and shipment timing. The bouquets arrived as expected and were absolutely beautiful, colorful and fresh. My daughter was delighted with the flower arrangements at her reception because they were "Just what I had pictured in my mind." 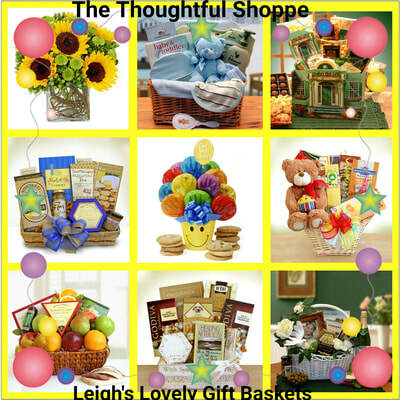 Thank you La Bella Baskets and Leigh for making such a memorable event all the more special." ( Customer ordered three of the " Delightfully Yours" Hand Tied bouquets ( no longer available) for her daughter's wedding reception in late May 2013. "Most of us have wanted to connect with love ones who are going through difficult circumstances, health related issues, or crises. Outside of the human voice we are limited when great distances separate us. I have personally found the caring ministry of Leigh's Lovely Gift Baskets to be a real God send. The quality of the products and exceptional service are hallmarks of La Bella Baskets and Leigh as a Consultant and Business Owner. "The fruit baskets have been of the highest quality. The Gift Baskets have included a wide variety of items. The flowers delivered were extremely beautiful and fresh. Some have remained fresh for over two weeks! All items have always arrived in a timely manner. When recipients go out of their way to express their gratitude, you know that it has been all worth while. In addition, Leigh's meticulous eye monitors the progress and has assisted me with unequaled support. I would recommend her products very highly." 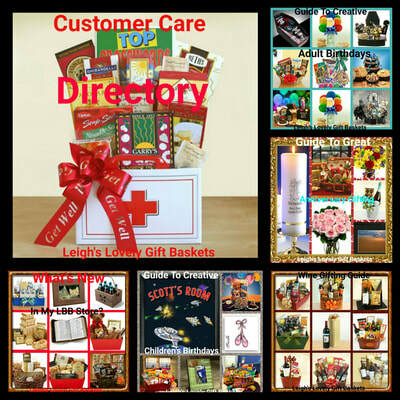 Click here for creative gift ideas and more!